The products sound like they are for women. I find it a bit odd for any man to use “Circle Eraser Anti-Dark Circle Eye Moisturizer,” or “Stop Lines Anti-Lines Moisturizer,” or “Vita Lift Anti-Wrinkle and Firming Moisturizer”–all of which are part of L’Oreal’s new line for women . . . 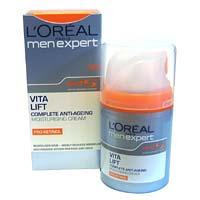 I mean, “men.” If “Vita Lift” sounds familiar, that’s because “Vita Lift” started out as a L’Oreal Women’s product and still is one. They try to make this stuff sound masculine by calling it “the Winning Team.” Maybe what they really mean is, “Play for the OTHER team.” This goop is anything but masculine. Somebody get this stuff off my USA Today Sports section. PLEASE. And don’t go to the L’Oreal men’s website, unless you want to hear bad, effeminate Yanni-style music and see gay models. It’s no coincidence that L’Oreal is FRENCH. * Then, there are the Olsen Twins. The greedy gazillionaire girls are not satisfied with their gazillions, apparently. So, to make even more, the’ve hired a new, younger set of girl twins to replace them as the spokesmodels of their Dualstar company. Except that the girl twins are really boys. They just look like girls. And it’s by design. 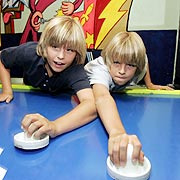 The Olsen Twins told the Wall Street Journal that these girlie-boy twins will be marketing male beauty products for young boys like the ones L’Oreal is shoving onto men’s sports pages. The male beauty industry for girlie-men is now cradle to grave. Male beauty products – like soap? So… when do you cross the line from being metrosexual to transsexual? The pussification of men. Them boys should play hockey on ice! Not on air. As a Christian, I am also perturbed by the feminization of Jesus in so much contemporary artwork. Makes him look like a wuss. And I can not stomach all the syruppy love songs to Jesus that pass for worship music in many churches today. Whatever happened to testosterone? Debbie, it’s not so much that men now want to look like effeminate, shaved Abercrombie & Fitch metrosexuals, we just don’t want to look prematurely old. I found your link when I did a search on L’Oreal’s dark circle eraser after one of my friends said my eyes looked like Uncle Fester’s from the Adam’s family. You may be coming back with the “Marlboro Man line”, about how men get better looking as they get better, but that’s as much bull as saying “women should age gracefully. The young and good-looking get the jobs, the promotions, the raises, and the better seats on airplanes. I’m not about to use concealer, blush or eyeliner, but I DO wear sunscreen. Where do you draw the line? Is it effeminate to wear aftershave? Or maybe I should skip anti-perspirant, too, so I can smell like a neanderthal? Handsome as Mike Rowe is, I bet you’d much prefer he take a shower and shave before coming home from his latest dirty job.